Bartending has evolved from a simple whiskey on the rocks, and customers are demanding more and more that mixologists spend time creating the perfect concoction to soothe their palates. Molecular gastronomy - the art of cooking with an advanced scientific edge - has boosted the abilities of bartenders to create that perfect chemistry of cocktails. Nitrogen : Liquid nitrogen has become quite a versatile material to cocktail creation, far beyond simply chilling glasses. Utilizing liquid nitrogen can help mixologists control the oxidation levels of the drinks they serve, which factors into precise taste profiles. The chemical also emits a smart-looking mist when exposed to the open air (think: Halloween drinks!). Because of nitrogen’s dangerous properties, though, users will need special training and containment techniques to ensure safety of employees and customers alike. Centrifuge : You’ve probably seen a centrifuge at any hospital, doctor’s office, or science lab. It’s that wheel that spins quickly enough to separate blood into weighted components. Now, the centrifuge is making an appearance at the bar too! In the same way that centrifuges separate blood, they also can separate sediments from fruit cocktails. 3D Printers : These are for the nerds in all of us. Three-dimensional printers are making a splash at the bar, giving bartenders the ability to create stunning garnishes. MIT's John Bush, professor of applied mathematics, developed a miniature vessel that can freely propel itself along the surface of a drink. As it travels, it releases alcohol with a higher proof to keep it trekking ever onward until it dissolves or succumbs to an impatient attendee. 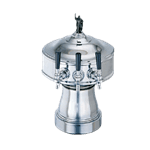 One can only guess what other interesting products will make their way into the bartender’s equipment arsenal, but we can be sure that whatever it is, it’s likely to continue to revolutionize bartending as an art.